Identify the optimal applications and clinical situations for the use of cryotherapy. Describe the benefits and challenges of using alternative approaches to ultrasound therapy. Implement alternative electrotherapy treatments outside the standard applications. Identify patient populations that may be responsive to laser therapy and implement these modalities appropriately. Therapeutic modalities, ranging from ice bags to laser therapy, are common in a clinical setting. 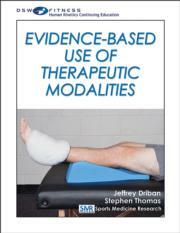 New claims and old ideas about therapeutic modalities constantly influence their clinical use. Therapeutic modalities can be an important tool in a clinician’s toolbox for managing pain, promoting recovery after exercise, reducing muscle inhibition prior to exercises, and possibly managing postconcussion symptoms. Evidence-Based Use of Therapeutic Modalities CE Course provides a comprehensive review of evidence for the use of common therapeutic modalities such as ultrasound, laser therapy, cryotherapy, and thermal agents. The 20 research articles in the course summarize the research, offer a clinical appraisal, and indicate the clinical relevance of the study. The articles are followed by an exam containing 100 questions. Upon passing the exam, you may print out and submit a certificate for continuing education credits. Evidence-Based Use of Therapeutic Modalities CE Course supports the initiative in the athletic training profession to integrate the best new research and evidence into clinical decision making, with the goal of improving patient outcomes.